Defense Carries Gulls to Another Road Win! 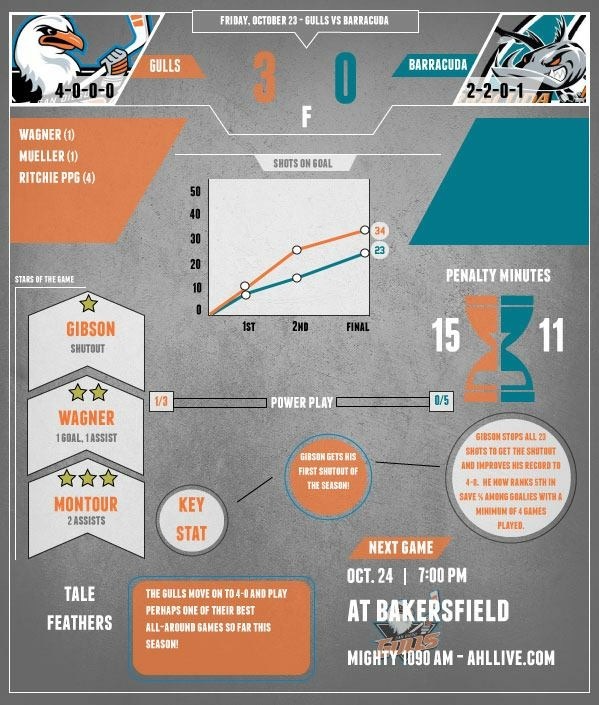 The Gulls blanked the Barracuda 3-0, for their first shutout of the season. The defense performed better than they have all year. The Barracuda’s best chance came in the first period on a 5-3 power play, only to realize John Gibson is in fact, a brick wall; the best goalie in the league. The net remained clean for Gibson’s first clean sheet for the Gulls, who made 23 saves, which he was compensated with by earning the top star. Penalty kill unit also played strong, stopping 5 power play chances, including a 5 on 3 for 1:08 in the first. Goals scored by Chris Wagner (1), Chris Mueller (1) the second, and Nick Ritchie (4) the third on a power play with 4:03 left in the second period. Offense died down in the third for the Gulls, but the boys in black iced the Barracuda, leading in shots 34-23. Attendance was low, very low. Friday night, and the AHL official site states just 3156 in attendance. However, Barracuda fans around were left asking “Where is everyone?” Attendance is a real head scratcher for the new team, and one fan reported that the Operations manager at the arena stated official attendance was 1,528.. interesting how the number doubles exactly on AHL site… Regardless, Road trip to San Jose= 4 points for the Gulls! 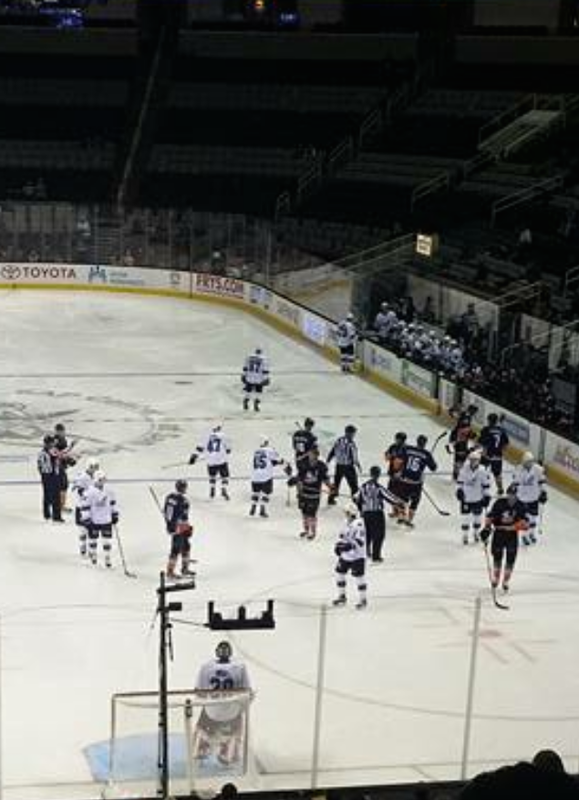 The Gulls have moved to 4-0-0 on the season, and have not lost yet (including preseason). The team ventures to Rabobank Arena vs Bakersfield tonight so tune in to 1090 AM to listen in! Game can also be viewed at Rockin’ Baja Lobster of Old Town via live stream or purchased from AHL Live. In addition, if you do not care for the Gulls announcer or want to listen to Bakersfield’s play by play, you can find it online or on Iheart radio at AM 970! Looking for Gulls merchandise? Check out gullsgear.com or the ahlstore.com/teams/san-diego-gulls! Through this week, purchases of $35 on GullsGear site get free hat of your color with promo code! (see image for codes/colors) that’s a $25.12 value FREE, only for remainder of this month! 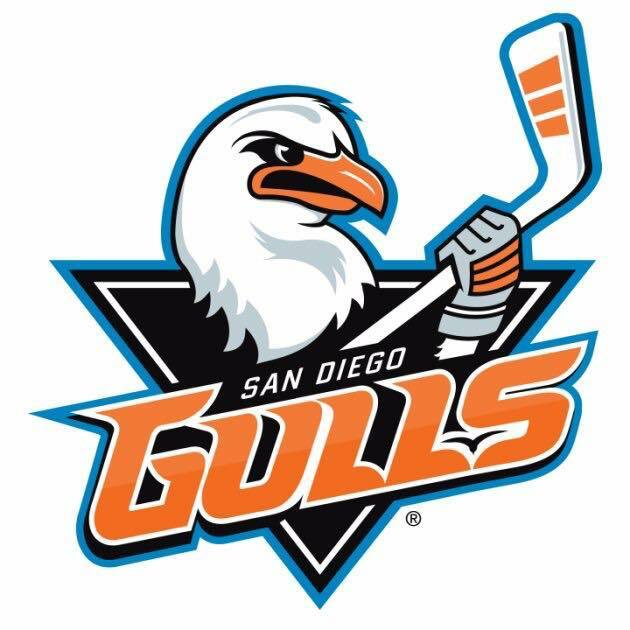 Get your Gulls Gear now and show off your love for San Diego’s Newest team!